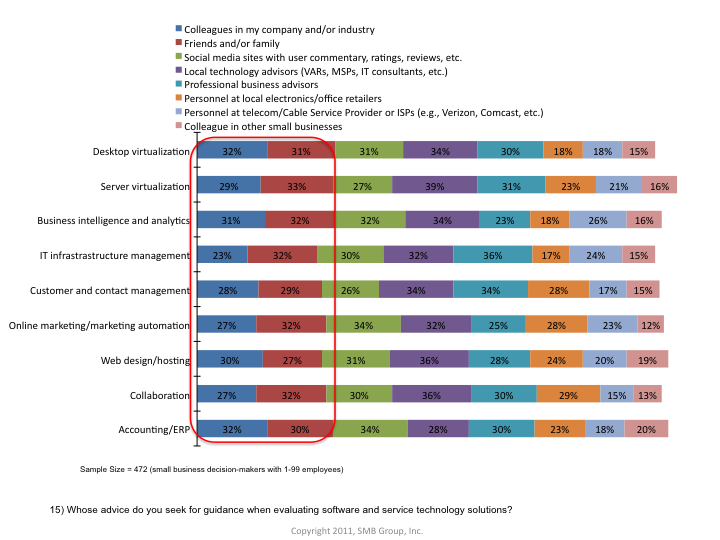 In SMB Group studies, small business decision-makers consistently put colleagues, friends and family at or near the top of the list as key sources for advice when it comes to selecting technology solutions for their businesses (Figure 1). So when start-up YouDazzle CEO and co-founder Cary Cole told me that YouDazzle will sell its newly launched cloud-based collaboration, storage and online meeting platform via a network marketing distribution strategy, he got my attention. Although companies from Avon to Tupperware have successfully deployed this model, YouDazzle is, as far as I know, the first applications vendor to take this approach. Integration with Dropbox to provide customers with branded data rooms and other extras. You can sync desktop files to YouDazzle with Dropbox and vice versa; instantly share Dropbox files with up to 100 people at once via YouDazzle web meetings; and add comments to files. Built-in analytics to monitor trends and decision-making processes and provide feedback on deals and projects. You can see who has visited your data rooms, uploaded and downloaded files, provided comments, etc., and customize how you’re notified about user activity. Pricing includes three options, all of which include live file sharing, screen sharing, unlimited rooms and guests, activity analytics, Dropbox integration and custom branding. Plans start with the entry-level Pro Plan, at $19.99/month, which includes 1 host and 20 GB of storage, and work up from there. YouDazzle offers a 14-day free trial and discounts on yearly subscriptions. A $49 sign-up fee gets you in the door to sell YouDazzle. Once you’re signed up, YouDazzle provides you with a business launch pack, which gives you a co-branded replicated web site and storefront (which interfaces with the YouDazzle web site). YouDazzle also provides training via local in person events, webinars, and materials that educate marketers on the network marketing compensation model. When you start selling YouDazzle, you earn a 20% margin on your first 3 sales. After that, you make 35% on subsequent sales–and you get a retroactive bump to 35% on the initial 3 sales that you made. Then the network component comes in, where you can make money on top of the network of other YouDazzle marketers that you recruit when they sell. Cole believes that cloud solutions for small businesses are a good fit for the model, for several reasons. The cloud has eliminated the need for marketers to install any hardware or software. Unlike network marketing for physical goods, marketers don’t need to invest in inventory (such as the suitcase full of Avon cosmetics). Small business owners look to colleagues, friends and family for guidance on technology solutions (as our research also indicates). Social media is overtaking traditional advertising and marketing. There are many competing collaboration solutions on the market for small business–from Citrix’s “GoTo” solutions to Google Apps. And some of these services are free. But YouDazzle believes it has a good blend of collaboration tools, and that custom branding, an easy to use interface, and strong entry point to current Dropbox users will help it develop a foothold in the market. Of course, the most intriguing bet that YouDazzle is placing is in its marketing and sales model. Cole thinks the network marketing will appeal to marketers that want to capitalize on the cloud opportunity. As important, he believes that their local, personal touch with prospective customers will differentiate YouDazzle from the typical self-service trial approach that is most prevalent in the small business cloud solutions market (although other approaches are emerging — see Going Beyond Free Self-Service Trials: Raising the Bar in Cloud Computing). The rationale is that a little bit of TLC will help prospects see how to use the tool more productively, boost conversion rates and nurture retention. In my view, this will be interesting to watch. Although network marketing has worked well in the consumer space for products such as personal care products and jewelry, will it work to sell business solutions to small companies? Sure, small businesses turn to friends and colleagues for guidance, but do they actually want to buy from them? Another challenge is that people seem to be on opposite ends of the spectrum in their perception of network marketing. Although some people love it, for others network marketing has negative connotations–ala “pyramid marketing.” These people get one whiff of network marketer coming and cross the street–they just can’t face another basket party or make-up demonstration from someone that they may feel some obligation to buy from. That said, I think a lot of YouDazzle’s success–or failure–rests on how well it can train its marketers. YouDazzle will not only need to teach them how to sell and implement the solution, but also how to make it most relevant to the different requirements of each small business. It will also need to structure things to ensure that marketers strike the right balance between recruiting new marketers, signing on new customers and supporting existing customers. Finally, it will need to help marketers avoid being pinned with the negative network marketing stereotype, by helping them understand things such as when a situation is appropriate for selling and when its not. Thank you for writing about YouDazzle! Regarding the question of whether SMBs will buy from network marketers… network marketers have successfully sold telecom, insurance and pre-paid legal services to SMBs for decades. You must keep regular gatherings to your team. It really is advantageous for the entire crew whenever you all gather consistently. If you’ve made the decision to start out a Multi-level marketing endeavor, you should consider the overall compensation package deal that is certainly open to you and whom actually you might have partnered or joined on top of. When you find yourself sure of the exact amount and regularity of the obligations and any other advantages you could have visiting you, you will understand regardless if you are spending your time smartly or ought to be accessible to other available choices. Keep your gatherings limited by 1 hour in length. If the multilevel marketing conference requires too much time, it is going to appear more advanced and time-ingesting for the potential customer. Examine whatever you failed and use the info learned to coronary heart. When you found an advert which says you may “make thousands on a monthly basis inside your leisure time!! !, you will not succeed. You will need to job very challenging at MLM if you would like do well. Make your assure that you just will make the most energy everyday, and will also pave how for the solid foundation in multiple-level advertising. You ought to produce thorough desired goals for each and every component of your own marketing plan. This can motivate you something to focus on and push anyone to keep going. A great way to look at your multi-stage marketing is just as a mad dash to sign up probably the most members. You should know up to you may relating to your merchandise. Look at independent distributors to see how you can product yourself when using multi-level marketing pros are accomplishing and gain knowledge from their positive results. You can never be certain that is considering what you have to market. When you need to develop a web site for mlm, utilizing social networking sites can easily get you started.A fascinating and nicely published website, frequently up to date website is an excellent method to add, after you have a web site and they are on social media sites. Your network boosts together with your on the web appearance within a sociable setting. We all love to have some thing ideal for just a great deal!Seek out mlm company which include discount coupons to discuss together with your customers. Individuals will be more prone to get a desire for your product should they have a lower price. Prior to investing anything in a advertising enterprise make sure to analysis them with the BBB. There are lots of legit businesses out there, but there are numerous less than great kinds at the same time. You must guarantee that this expense remains safe and secure. The information on this page will assist you to raise the success rate. In the end, your ultimate goal is to bring in as much earnings as you possibly can. Make sure to utilize each of the info you may have been provided on this page, and push you to ultimately become successful. Hey Laurie, thanks for heading up with YouDazzle. From my point of view, the integration with dropbox and web meeting are two important features that most of the small business decision makers often use to tackle and sort out their day to day decision making processes. As with web meeting and drop box file sharing, the small businesses can do lots of cost cutting on communication expenses & storage expenses. I would say, by using cloud technology YouDazzle helps a lot of small businesses.